As the owner or manager of a newsagent, you’ll appreciate all the hard work that goes into running a successful business. One thing that you will have to deal with is keeping your business safe against the risks that threaten its financial stability. Whether you run a small newspaper shop on a local street, or own a bigger store in a bustling city centre, there are various risks involved with the daily running of your business. Taking out insurance designed specifically for newsagents is one way in which you can guard against these threats. Listed here are some examples of the types of cover that you might include in your insurance policy depending on your circumstances and priorities – as well as your attitude to the factors that could compromise your business’s finances. If you operate as a newsagent from a corner shop, as opposed to a street stall, you’re likely to consider having your premises insured. This form of insurance covers you in case of damage to your premises by unforeseen events such as a storm, flood or fire. It is also designed to cover loss that may occur due to intentional acts such as vandalism and arson. 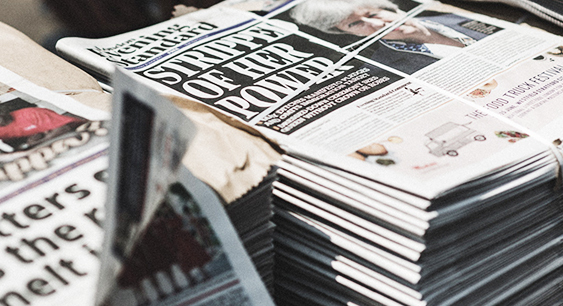 There’s a good chance that your newsagents sells a wide range of products - from confectionary and groceries to stationary, newspapers and magazines. As such, you may want to consider insuring your contents and stock against damage, loss and theft. Your business may be exposed to the threat of malicious acts, vandalism and theft which could make contents and stock insurance a valuable form of cover for you. In the event of burglary or damage to stock in your shop, insurance can help to cover the financial loss you might suffer as a result. It is generally advisable to have public liability insurance in place if your business involves interacting with public on a daily basis. As a newsagent, many customers will typically come through your doors every day. In the event that any of them suffer an accident on your premises that results in them making a claim for compensation, this form of insurance can cover the expenses you might face as a result. Transport of goods is a necessary task for most businesses and a newsagent is no exception. Every time your stock is in transit, it is exposed to the risk of damage and theft. You may even experience instances of malicious acts resulting in severe destruction of your vehicle’s contents. Events like these could disrupt your business significantly. This form of insurance may help in cases where loss occurs in a vehicle owned by you or your business. This form of insurance provides financial protection in the event that your business's ability to operate at full capacity is compromised due to unexpected circumstances. For example, your newsagents may be disrupted by repair work that is being carried out as a result of extreme weather damage. In a situation such as this, you may suffer loss of income, which could affect your ability to pay your outgoings. Business interruption insurance could help to cover the financial losses you experience during this hiatus, to make sure that your business’s survival is not negatively affected. The above list includes only some of the more common forms of cover taken out by newsagents, and it’s likely that you will also want to include additional forms of protection in your policy that are tailored to your business’s individual circumstances. When purchasing an insurance policy, it’s important that you consider any special circumstances that you may have – and make your insurance provider is aware of them – to ensure that you take out adequate protection. There could be a number of situations which would require your business to have specially tailored cover. For example, your newsagents may be situated within another, larger business, such as a bookshop. In this case, it’s possible that you may not need to take out buildings insurance, as the other business or building owner is likely to already have it in place. It could also be the case that you need to have specific wording under your public liability cover, due to the increased customer footfall you may experience from the other business. Whatever your needs, be sure that your newsagents insurance adequately reflects them in order to ensure you don’t leave your business exposed in a vulnerable situation.